The third building, 2,950 square feet in size, was permitted on Feb. 28, and construction is underway. The activity at the business park is reflective of the upturn in commercial construction in the county since the first of last year. The 3.3-acre-tract was rezoned from residential to Office-Institutional-Professional use over the objections of some residents in nearby subdivisions in March of 2008 but was only partially developed and sat neglected until late last year. The two constructed buildings and the one permitted on Feb. 28 are at the rear of the property, with all of the frontage on busy Hog Mountain Road still unbuilt but now cleared. The business park now has a paved entranceway and parking lot. The three permits are for construction of the building shells only, not the interiors. Permits for interiors usually are issued when a tenant has been identified. 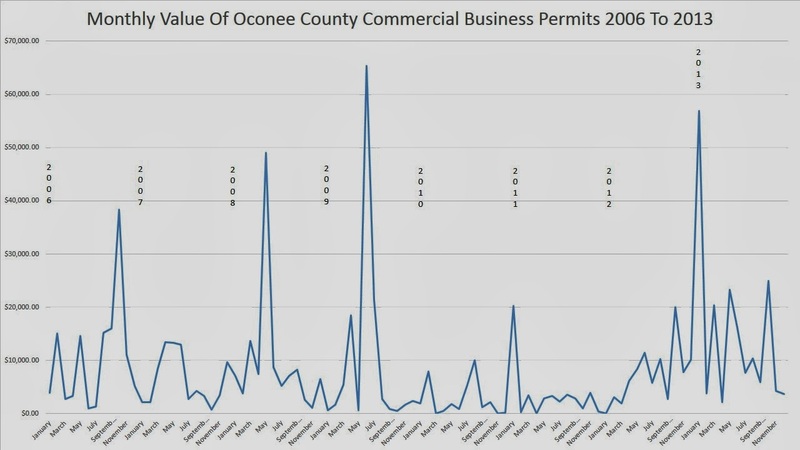 The permits were issued to Darrell Sosbee, an Oconee County resident and developer who lists his business address as 105 Old Epps Bridge Road in Athens-Clarke County. The address of Legacy Business Park is 1800 Hog Mountain Road. Sosbee also developed Twelve Oaks Place business park just east of the site for the Legacy park. The county has approved modifications to the plans Sosbee and his father, Roy Lee Sosbee, submitted when they asked for the rezone in 2008. At that time, the developers planned four buildings, two fronting on Hog Mountain Road and two behind those, with one building backing up to the residential properties behind the business park. The total square footage was to be 27,000. In 2010, Smith and Associates of 1022 Twelve Oaks Place submitted a revised preliminary site plan showing three buildings fronting on Hog Mountain Road and seven smaller ones, including the two constructed and the third most recently permitted, behind. Total square footage of the 10 buildings will not exceed the allowed 27,000, according to those documents, which were approved by the county on Feb. 19, 2010. The county issued 105 commercial permits in 2013, exceeding the 69 issued in 2006. I did not report the value of the property for which the permits were issued, and one reader suggested that the county was issuing more permits but that the value of the property constructed is lower. Linda Patterson in Code Enforcement told me that the county charges $10 for each $1,000 of the value of a commercial building for which a permit is issued, up to $50,000. After $50,000, the county charges $5 for each $1,000 of value. These rates have not changed going back to 2006. In 2006, the county received $128,013 in fees for the 69 commercial permits; in 2013, it received $179,488 in fees for the 105 commercial permits issued. The comparison is not perfect given the discount for larger permits, but it is consistent with the overall findings that commercial development has returned to the county. The chart below shows that permits issuance varies by month across a year, but 2013 clearly was a growth year. The county does not charge for residential permits based on estimated value of the construction, but rather charges based on square footage, so it is not possible to make this same comparison for growth in residential permits. Residential permits grew from 441 in 2006 to 502 in 2013. Residents of Stronebridge and of Indian Hills subdivisions were most outspoken in opposition to Legacy Business Park back in 2008. The former mostly were concerned about traffic, while the latter were concerned about commercial development next door to residential properties. The county listed an unusual set of restrictions on the rezone, prohibiting 35 different uses normally allowed in an O-I-P property. Included were direct selling establishments, wholesale trade operations, and electronic shopping and mail order businesses. After the rezone, the site was graded and foundations were poured, but during the recession it sat empty and appeared to be abandoned. B.R. White, director of Code Enforcement, told me the county has no regulations allowing it to force developers to maintain the appearance of their sites during construction.